Owlstone Medical said today that its Breath Biospsy platform services will be used by AstraZeneca to identify novel biomarkers differentiating between disease phenotypes for asthma and COPD, through a collaboration whose value was not disclosed. AstraZeneca will gain access to Owlstone’s Medical Breath Biopsy services, which include development of classification algorithms to identify breath biomarkers for precision medicine applications across asthma and COPD. Breath Biopsy is designed to offer a rapid, non-invasive approach to identifying breath-based biomarkers, identifying disease phenotypes and treatable traits, with the goal of helping to stratify and monitor patients so they receive the right therapy at the optimum dosage. “Through our Breath Biopsy services, we are well positioned to assist the AstraZeneca team to explore how Breath Biopsy can identify novel biomarkers for asthma and COPD and to optimize their application in precision medicine,” Billy Boyle, Owlstone Medical co-founder and CEO, said in a statement. AstraZeneca is the second biopharma giant with which Owlstone Medical has announced a collaboration in recent months. In November 2017, GlaxoSmithKline agreed to integrate the Breath Biopsy platform into a Phase II clinical trial of its respiratory disease drug candidate danirixin. The study is designed to assess whether the right patient for the right treatment can be identified, as well as assessing the oral chemokine (C-X-C Motif) receptor 2 (CXCR2) antagonist as a potential treatment for COPD, Owlstone Medical said. 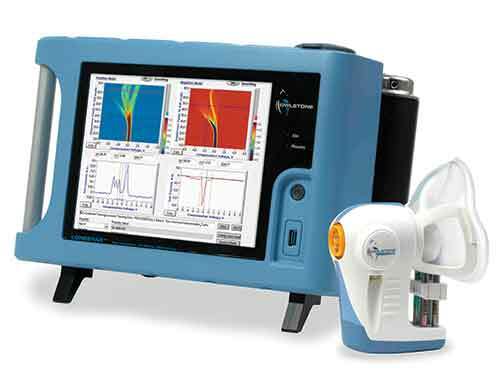 Breath Biopsy services are based on an Owlstone Medical technology platform originally named Field Asymmetric Ion Mobility Spectrometer (FAIMS), a non-invasive chemical detection system designed to measure volatile organic compound (VOC) biomarkers from breath, urine, and other bodily fluids. Last year, Owlstone Medical partnered with Warwick University and the University Hospital Coventry and Warwickshire NHS Trust to launch the InTERCEPT trial, in which 1,400 patients will have both their urine and breath tested using Owlstone Medical’s ReCIVA breath sampler and Lonestar gas analyzer. Owlstone Medical’s announcement comes a month after the company said it raised £11 million ($15 million) toward commercializing the breath Biopsy platform globally, as well as deepening its early detection pipeline with ongoing trials across multiple cancers—and further growing its precision medicine services to biopharmas. The funding round was co-led by current investor Aviva Ventures, the venture capital arm of global insurance giant Aviva, and Horizons Ventures, the private investment arm of investor Li Ka-shing—Hong Kong’s richest man and the world’s 23rd richest billionaire, according to Forbes—with follow-on investment from other existing investors. Owlstone Medical has raised a total $38.5 million in equity financing. That includes a 2016 investment of £4.9 million ($6.9 million) from Medtekwiz to fund ongoing development and clinical trials of its breathalyzer technology in lung and colon cancer screening. Earlier that year, Owlstone Medical was spun out of Owlstone Inc. to develop and commercialize Breath Biopsy technology for a disease breathalyzer with applications in diagnosing cancer and inflammatory and infectious diseases.